President Donald Trump's first official State of the Union address included remarks on immigration, the opioid epidemic, tax reform, and foreign affairs. Here are seven lines that stood out. 1. Over the last year, the world has seen what we always knew: that no people on Earth are so fearless, or daring, or determined as Americans. If there is a mountain, we climb it. If there is a frontier, we cross it. If there is a challenge, we tame it. If there is an opportunity, we seize it. 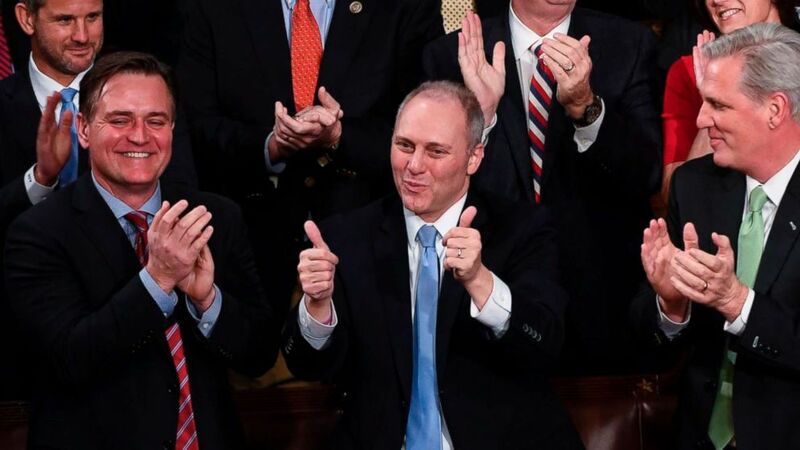 Trump mentioned several guests at the State of the Union including police officers that saved Rep. Steve Scalise, R-Louisiana, after a shooting in Alexandria, Va. He called on Republicans and Democrats to come together to "deliver for the people we were elected to serve." (Saul Loeb/AFP/Getty Images) US Representative Steve Scalise gestures as President Donald Trump speaks during the State of the Union address at the US Capitol in Washington, Jan. 30, 2018. 2. We all share the same home, the same heart, the same destiny, and the same great American flag. The president continued his call for unity to focus on the country's economic future, mentioning the recent tax bill and telling people watching at home that it is a good time for the "American Dream." 3. Preston's reverence for those who have served our Nation reminds us why we salute our flag, why we put our hands on our hearts for the pledge of allegiance, and why we proudly stand for the national anthem. 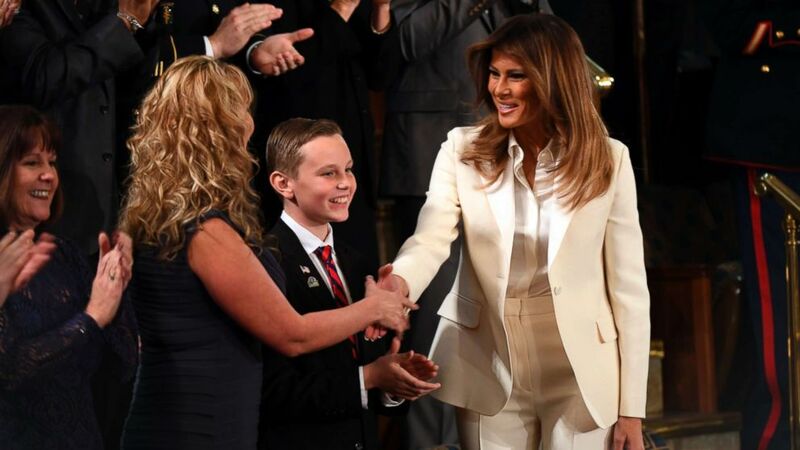 Trump pointed out one of the first lady's guests, 12-year-old Preston Sharp. Preston started a movement that placed 40,000 flags on veterans' graves for Veterans Day. He was cheered by some in the chamber for his reference to standing for the national anthem, which was the subject of attention earlier this year after NFL players chose to kneel in protest of incidents of police brutality against African-Americans. Trump was critical of the protests and called the players disrespectful. (Jack Gruber-USA TODAY NETWORK) First Lady Melania Trump shakes hands with one of the guests after arriving for the President's State of the Union address from the House chamber, Jan. 30. 2018. 4. Americans love their country. And they deserve a Government that shows them the same love and loyalty in return. The president said Preston's story was a good example of civic duty, going on to say that the administration has worked to restore trust in government over the last year. 5. So tonight, I call on the Congress to empower every Cabinet Secretary with the authority to reward good workers — and to remove federal employees who undermine the public trust or fail the American people. Trump made this comment after discussing reforms to the Department of Veterans Affairs, saying that 1,500 VA employees who "failed to give our veterans the care they deserve" have been removed from their jobs. 6. Americans are dreamers too. The president called for Republicans and Democrats to come together on a vote for immigration reform, saying that Congress should vote to protect citizens of every background. But his comments on immigration were met with mixed response in the chamber. Many Democrats did not applaud his description of a compromise on immigration reform. 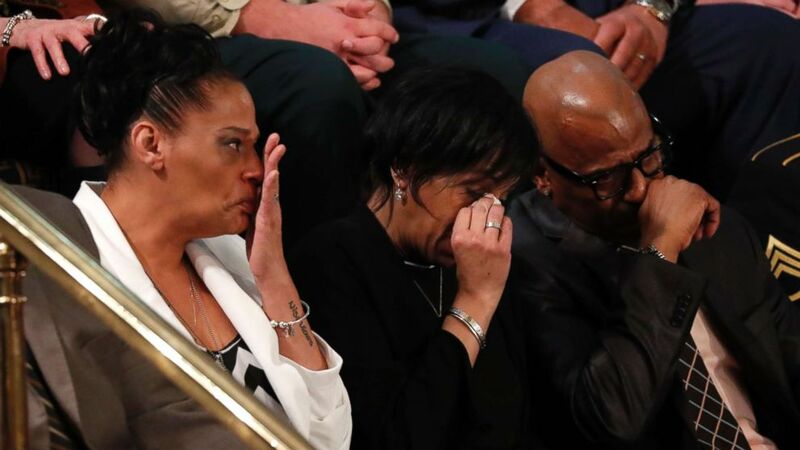 Before this line Trump introduced the parents of two teenage girls who were allegedly murdered by members of the MS-13 gang, saying that the gang members took advantage of loopholes in immigration laws to come to the U.S.
(Reuters) Elizabeth Alvarado, Robert Mickens, Evelyn Rodriguez, and Freddy Cuevas, parents of two girls who were chased down and murdered and whose deaths were among a string of 17 Long Island slayings that have been attributed to MS-13, cry as U.S. President Donald Trump introduces them during his State of the Union address in Washington, Jan. 30, 2018. 7. Most importantly, these four pillars will produce legislation that fulfills my ironclad pledge to only sign a bill that puts America first. So let us come together, set politics aside, and finally get the job done. Trump laid out the four pillars of his immigration plan that he says represent a compromise between Republicans and Democrats. The proposal includes a path to citizenship for DACA recipients, funding for the border wall, ending the visa lottery system and ending chain or family immigration policies.